In the Pacific Northwest, we are lucky to live with a bounty of fresh seafood, meats, vegetables, and fruits, all carefully tended and harvested just minutes from our stores and restaurants. So when you choose your salmon, make sure it’s locally caught, wild Sound Catch salmon. Just one taste, and you will recognize the quality only wild Washington salmon can offer, and you’ll be supporting local fishermen, who ensure the continued availability of this sustainable seafood product. Sound Catch salmon is a healthy, all natural source of protein that’s high in omega-3 fatty acids. These super-polyunsaturated oils have been shown to be beneficial for overall health, and are particularly helpful in preventing heart disease. And because Sound Catch salmon is so quick to prepare, it’s easy to treat your family to a delicious and nutritious meal. Click on the links here to learn more about Sound Catch salmon. You can also download and print our product fact sheet. In Washington, commercial fishermen catch all five species of wild Pacific salmon – king (or Chinook), coho (or silver), sockeye (or red), keta (or chum) and pink (or humpback). In terms of size, flavor, texture and color, king salmon deserves its royal status and superior price. These magnificent fish are prized for their flesh color, high oil content, delicate texture and succulent flesh. Most sockeye go to Japan where they are highly prized for their distinctive deep red flesh color. However, an increasing percentage of the catch now remains in the U.S., as the domestic market discovers the superior attributes of sockeye. Like king salmon, the levels of polyunsaturated oils in sockeye give it a succulent textures and rich flavor. Coho are similar to king salmon in taste, color and texture. 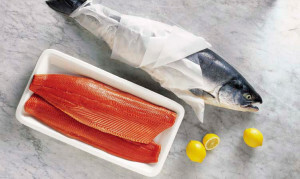 Coho are distinguished by their orange-red meat color and firm texture. Their size, relatively high fat content and excellent color retention properties make them popular in both fresh-frozen and smoked forms. Pink salmon are distinguished by their light, rosy pink-colored flesh, tender texture and delicate flavor. Pink salmon have a lower to moderate oil content. Sound Catch™ is always top quality wild salmon selected for discriminating buyers. In fact, the fishermen participating in the Sound Catch program have all agreed to immediately bleed and chill their fish on board the boat. This practice produces premium fish with great flavor and a long shelf life. Look for the Sound Catch label to ensure you are receiving this superior product. Salmon in Washington are carefully managed to ensure their sustainability. 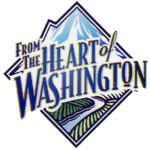 The State of Washington sets strict limits on the fish to be harvested each season, which protects a portion of the run and allows it to spawn. Sound Catch fishermen support the efforts of the State to maintain the important resource, catching only surplus salmon. By following this sustainable management practice we can all enjoy a healthy salmon resource in the future.